Providing you the best range of badminton court flooring, squash court wooden flooring, academy sports flooring, portable indoor sports flooring and table tennis court flooring with effective & timely delivery. We are deal in this Badminton Mats. A One Wood Craft offers the most advanced, professional squash courts for national and international games. 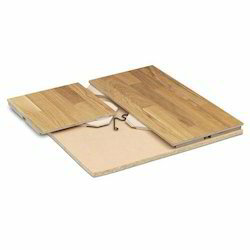 A One Wood Craft’s Air Cush Wooden Flooring system, confirming the requirement of the World Squash Federation (WSF), consists of Kiln Seasoned (dried) imported American or Canadian Hard Maple or European Sycamore Wood surface boards and the under frame made of Imported Fir/Spruce/Pine Wood runners from New Zealand (Australia) or Germany. We do have vendors in each state that makes us the biggest supplier of Maple Wooden Flooring in India. 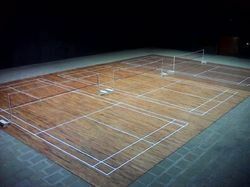 We do have Squash Court Flooring Manufacturer unit in Mumbai. These surfaces are approved by the World Squash Federation (WSF). Surface Board :- Made of Kiln Seasoned (moisture contain of approximately 14% at the time time of dispatch), Treated Maple Wood finished with 21 mm thick, 57 to 83 mm wide and in random length in tongue and groove shape. The edges of the boards will have a finger lock groove and the bottom side with air pass groove and treated with special anti-termite and water resistant lacquer. 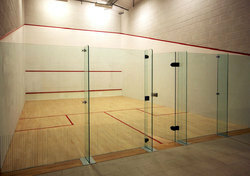 Maple wood is hardest woods and is the recommended wood for squash court and approved by WSF (World Squash Federation). All major tournaments are played on Maple Wood Floor only. The Installation: The IPS sub-floor to be treated with Acrostic and a vapor barrier of 1- 2 ml. (100 – 200 micron) thick to be placed on the leveled IPS sub-floor before lying the under frame. The runners having air-cushion pads to be placed on the vapor barrier in perfect level at 350 mm c/c in one direction. The surface boards will be screwed to the runners through the tongue only and will lock the screwed tongue by the groove of the adjoining boards. The ends of the boards will be locked by inserting the wooden fingers through the edge grooves and fixed with suitable adhesive. An expansion of 8 to 10 mm to be left open between the wooden flooring and the surrounding tiled area / walls. The Finishing: After installation the floor will be machine sanded in uniform level and finished with PU Polishing water based polyurethane lacquer. The Game line marking to be carried out in required colors before applying the finish coat. 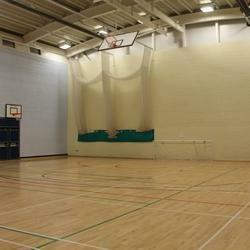 Maple Wood :This is the hardest of hard woods and is the recommended wood for Squash, Basketball and Badminton Courts. We are one of highly appreciated unit engaged in offering Academy Sports Flooring cost-effective solution which we would propose for installations where under floor heating is to be installed or where the subfloor is uneven. 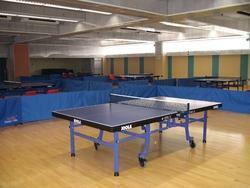 We are offering Portable Indoor Sports Flooring to our clients. With the constant support of our professionals, we are fulfilling the varied requirements of clients by offering optimum quality Table Tennis Court Flooring . Design: This design can anti-skid and it is comfortable to step on. Features: Waterproof, Flameproof, Stand wear and tear, So on.